PanARMENIAN.Net - Armenian midfielder Aras Özbiliz has left Willem II. The Dutch club terminated the lease agreement with the 29-year-old after his refusal to replace a teammate in the 27th round Eredivisie match against Fortuna Sittard. Thus, the Armenian player will return to the Turkish Besiktas, from which Willem II had rented him in August 2018, Sport24.com reports. Ozbiliz played 18 matches for Willem II, scoring two goals and contributing with two assists. Aras signed a 4.5-year contract with Besiktas in January 2016 and went to Spain’s Rayo Vallecano on loan shortly afterwards. He returned to Turkey half a year later. 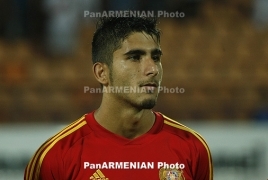 In February 2018, the Armenian attacking midfielder signed a contract with Moldova’s Sheriff, the club’s official website revealed then.